Home Pedal Line Friday – Call for Submissions! Pedal Line Friday – Call for Submissions! In 2009 I published the first Pedal Line Friday post for Effects Bay. I remember it was a person that had some sweet gear and wanted to promote their band. I published the post, and I was blown away by the response from the readers out there – which eventually ended with a flood of new submissions. Every week, I started to post these Pedal Line Friday (PLF) posts and it was clear that this was a popular portion of the website and you, the readers were looking forward to it. I like featuring gear, and in particular, I enjoyed featuring gear from the Effects Bay community. The benefits of Pedal Line Friday is simple. To see what people are running, but also the “why” people are using a particular pedal. 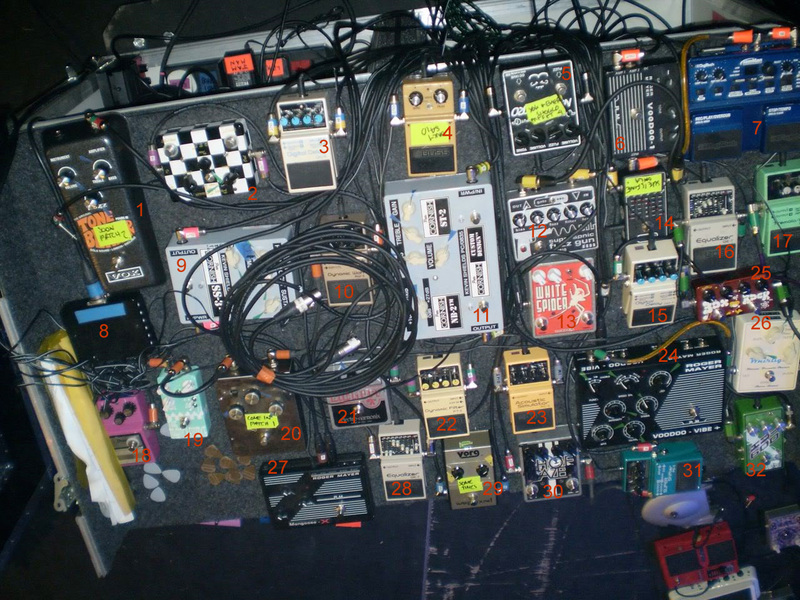 The routing is critical too – why is this pedal in front of that pedal, etc. We all take these little knowledge nuggets and look at our own gear. We might find inspiration from a PLF post and restructure/re-route our own set up, or possibly get a new pedal on the “Want to Buy” list because we continually see it on featured boards, etc. With every Pedal Line Friday post I encourage submitters to promote their particular band or project page. Throw up a Facebook or BandCamp link so we can hear what this particular pedal line is all about. Today, I wanted to reach out to the community and ask for more submissions! If you’ve posted a Pedal Line Friday submission in the past – I’m assuming things have changed from your original post. Please re-submit! Mention the changes and the reason behind those changes. It’s valuable information. If you don’t have a board – I don’t care. That is not a requirement. If you have a pile of pedals on the floor, that counts as a pedal line! Write something up – routing of the pedals. Listing of the pedals. Reasons of why you’re using that pedal and why it’s placed there. Be descriptive! Describe the application – what style of music you play, etc. Again, be descriptive! Once you have all of this, send all of this to pedalline@nulleffectsbay.com. This will end up in the Pedal Line Friday submission queue. Almost all submissions are approved for publication, but some are not – typically due to no or very little content, or image is too small, etc. I think we would all love to see what you guys have going on, so submit your set up today!